Most expectant mares will lie completely prone before and during the foaling process. EquiFone was designed to detect when the mare is lying in the foaling position, and alert the breeder via telephone to help insure that someone is in attendance during foal delivery. The receiver/dialer receives the signal from the transmitter on the mare when she lies in the foaling position. It then dials all of the pre-stored telephone numbers and plays a pre-recorded message to each as they are answered. The receiver/dialer is placed in an indoor area, and connects to a standard phone jack. It is powered by an AC adapter that plugs into a standard electrical outlet. The membrane keypad on the receiver/dialer is dustproof. NOTE: To use EquiFone, you must have at least 2 telephone numbers available. One for EquiFone to call out on, and another one for EquiFone to call to. EquiFone cannot call the same telephone number that it is connected to. The receiver/dialer is plugged into a land line phone jack or the Wireless Terminal , and it calls a cellular or other phone to alert the breeder, when the mare lies in the foaling position. If you do not have a land line you may be able to use our Wireless Terminal described below. The transmitter is powered by a 9 volt battery. It is inserted into an adjustable pouch that is attached to the rings on the sides of the mares halter, and it hangs under the head just forward of the throatlatch area. When the mare lies flat out in the foaling position the transmitter sends a signal to the receiver/dialer. There is a built in delay of 8 - 10 seconds before the transmitter sends the signal to the receiver/dialer to prevent false alarms in the event the mare just lies down and gets up again. The mare (including miniature horses) does not realize she has the transmitter on. The transmitter mounts on the mare in the throatlatch area. Mounting it in this manner prevents it from getting wet when the mare drinks and from getting hung up on water buckets and feeders which can result in false alarms. There is no limit to the number of transmitters that can be used simultaneously with one receiver/dialer. The Wireless Teminal is a base station mobile phone. It enables connection of landline devfices such as the EquiFone system, a telephone handset, fax machines, etc. It transmits using the mobile phone networks. 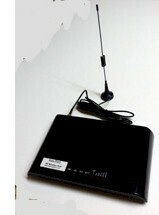 Being completely wireless, the Wireless Terminal is used in those sutiations where a land line is not available. The Wireless Terminal will operate world wide. You must provide a SIM card for it. You can purchase a "pay as you go" SIM card from several vendors on-line or from your cell phone provider. The distance for transmission from the transmitter on the mare, to the receiver/dialer is up to 500 feet. Transmission strength is enhanced by having a clear line of site between the transmitter and the receiver/dialer. The appropriate power adapter/plug (120 - 240 volts - 50 - 60 Hz) will be shipped at no extra charge for the USA, UK, Australia, and Europe. EquiFone will work for any size/type horse. The only difference between horse sizes is the length of the straps that connect the transmitter pouch to the mares halter. Two years, 100%, parts and labor.